NOTE: Be sure to also visit the “PURPLE PEOPLE EATER” theme! Paint and color large sizes and shapes of paper in shades of purpl. Hang them on the walls in art gallery fashion. Several identical and very large purple paintings would look great going across a wall in gallery-wall style. You could also mount purple fabric or paper! 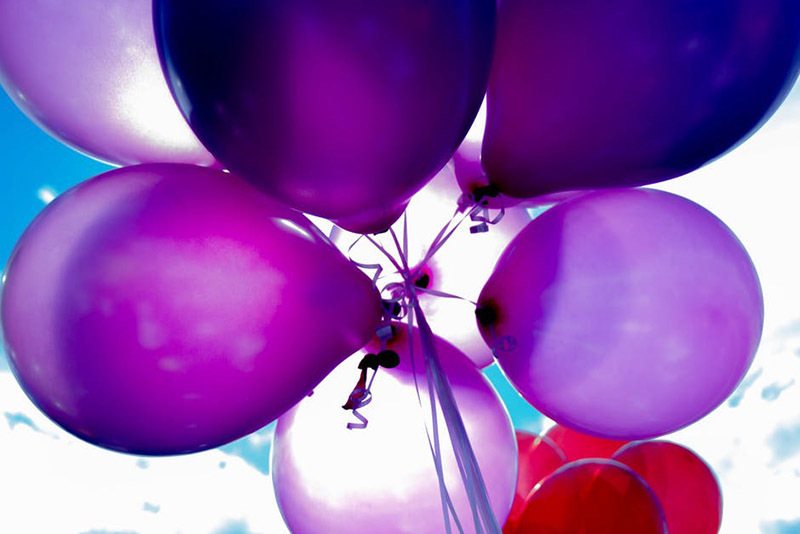 Have kids/guests come DRESSED, in purple, violet, lavender, orchid or white! Have PURPLE MAKEOVERS with purple eye shadow, purple lipstick, purple nail polish, purple hair ribbon, etc. Mix together flour, salt, oil, and Kool-aid. Add the cup of almost boiling water. Mix well. Knead the mixture until it forms a soft dough. Your play dough will be the scent and color of the Kool-Aid! *Any other unsweetened, powdered drink mix may be substituted. 1. Mix paint and water together. 2. Pour the mixture into a wax coated paper cup. 3. Cover the cup with plastic wrap, then insert the craft stick through the plastic wrap in the center of the cup. 4. Place the cup in the freezer and freeze until solid. 5. Remove the paper cup and plastic wrap from the Freeze Pop Paint. 6. Dip the paint into water and paint on white paper. Material Ideas: Purple fabric scraps, purple paper, purple tissue paper, purple yarn, purple buttons, purple cotton balls, purple milk jug caps, purple confetti, purple paint chip samples from the paint or hardware store, etc. On finger-paint paper, draw or copy a lot of grape stems. Using purple finger-paint- have children use their thumbs to fill the page with “purple grapes”! Dip sponge pieces into thick purple paint. Print on sheets of white or light blue paper. Tip: Clothespins can be clipped on the sponges and used as handles. 3. Repeat this with each “color” you’re making, pouring them into separate containers. Paint with ordinary paint brushes, cleaning the brush between colors. Allow artwork to dry overnight before scratching and sniffing. Mix dry ingredients together, then add wet ingredients. Paint. If it is stringy–add a drop of glue. If too hard– add more starch. Mix in a couple drops of purple food coloring-or red and blue. Chill for at least 2-3 hours. It becomes runny when too warm. Mix one cup condensed milk with a few drops of red and blue (or purple) food coloring. 1. Place a palm size dollop of shaving cream into the ziploc bag; add a few drops of blue and red food coloring. 2. Zip up the bag, removing all the air you can before sealing. The kids can “knead” the bag to mix the colors – red and blue make purple! Give each child finger paint paper. Add red and blue food coloring to shaving cream and have the children mix it to see what colors it makes. Sprinkle Kool-aid crystals onto a piece of paper. Have children spray water from a spray bottle onto the paper. Use grape mix as well as blending red and blue. Put out shades of purple paint, from dark purple to lavender at the easel or art table. Take 1 cup sand and 1 T. powdered paint. Mix and put into a shaker. Put glue design onto paper-Shake sand onto the glue. Make necklaces out of dyed wagon wheel pasta. (See directions for dying pasta in “Pasta Category” or page bottom of ‘Art Recipes’. The children use tipped yarn and thread on the wagon wheels. 1. Remove the label from a clean, clear 16 oz. plastic soda bottle. 2. Pour at least 1/2 cup of light corn syrup into the bottle. Add a few drops of purple food coloring and some glitter and/or confetti. 3. Hot glue the lid onto the bottle. Swirl and shake the bottle to watch it’s movement. TIE DYE T-SHIRTS with colors of purple! See directions and tips for tie-dye-Click Here… T-Shirts are half-way down the page of ‘Crafty Gifts’. 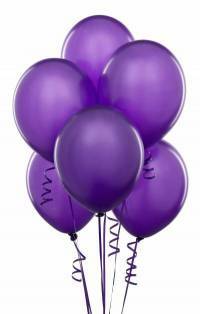 Blow up a balloon to a size of a softball or larger; cut about a 2 to 3 foot of purple yarn (depending of size of ball) and put it in bowl of Elmer’s glue. 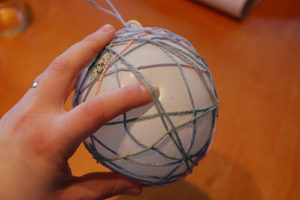 Take out the yarn and begin wrapping it around balloon. Hang the balloon to dry for 24 hrs or till the glue is dry. Pop the balloon and carefully remove it. You can hang this yarn balloon from the ceiling, branches or ______! Click here to see winter-time finished ball! You could also make PURPLE YARN BOWLS! Directions and photo are on Page 2 of Art Activities page-near page bottom. After filling AN ice cube tray with water– add drops of red, and blue food coloring in the compartments. After cubes are frozen, place a red cube and blue cube in a glass. As the cubes melts, watch what happens! Add 4 TBSP of white Elmer’s glue to 2 TBSP of liquid starch. Mix together…if it’s too stringy, add a drop of glue. If too hard, add more starch. (The play dough ideas up above in ‘Art’ is also science! For each child mix 1 tablespoon Epson salts and 1 tablespoon water in a baby food jar or a clear plastic glass. Stir in 1/4 teaspoon of purple food coloring. Have children observe over the next few days as the water evaporates and small crystals begin to form. Keep a magnifying glass handy for closer examination. Cut the bottom of celery stalks and set them in glasses of PURPLE tinted water; the longer the stalks are in water, the deeper the color will be. The stalks will absorb the color and then the kids can eat them! Take a stalk of celery and slice it up the center leaving it connected at the top. Place the celery stalk in two containers of colored water. Example: To get purple, put one side in red, and the other in blue. Leave it for a day or two and watch how the veins in the celery turn color as it takes up the water. You can also include a discussion of plant life with this activity. Blueberries, blackberries, raspberries, plums, Purple and red grapes, cherries. Make Peanutbutter and Grape JELLY/JAM SANDWICHES–cut with cute cookie-cutters if desired. Add purple food color to a sour-cream base DIP — and serve with veggies. Putting veggies on tooth picks and inserting into an EGGPLANT would add to the purple theme! Serve CREAM CHEESE ON CRACKERS –Tint cream cheese purple (blue if can’t find purple) and spread on crackers. Make purple or blue POPCORN balls tinted with food coloring and blueberries. Frost a CAKE OR CUPCAKES with frosting tinted with purple food coloring. Or–have kids FROST PLAIN SUGAR COOKIES with purple colored frosting. Decorate with purple sprinkles and candy. Have the kids make Berry Smoothies! Add a small amount of food coloring to the water before putting in ice cube trays and freezing. Add a grape to each if desired. Freeze grape juice or soft drink in ice-cube trays. Blend juice and ice cream– add soda. Make frozen concentrate juice by the directions on can, substituting carbonated water for the regular water. Looking for ‘Purple People Eater Ideas? 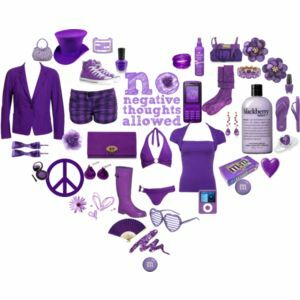 VISIT OUR PURPLE PEOPLE EATER THEME! Lots of fun ideas!